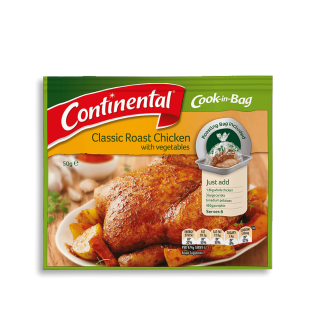 Made with real paprika, onion, garlic & black pepper, enjoy a Classic Roast Chicken in 3 easy steps with the help of Continental Cook in Bag. Learn more here. The easy, no mess way to cook! Onion, maltodextrin (from wheat), thickener (1422), sugar, salt, spices [paprika(2.5%), cumin (contains wheat deritatives), black pepper], wheat flour, flavours, garlic (2%), thyme (0.6%), colour (caramel lV),sunflower oil, food acid (citric), flavour enhancer (627), herb extract. Allergens:Contains wheat products. Made on equipment that also processes products containing milk, soybean, peanuts, sesame, egg, fish and crustacea. Step 1. MAKE IT: Preheat oven to 180'C. Place whole chicken into roasting bag. Add peeled and chopped carrots, potatoes and pumpkin. Step 2. SHAKE IT: Add Recipe Base and close bag using included tie. Gently rotate bag to coat evenly. Step 3. BAKE IT: Place on oven tray, in a single layer. Pierce top of bag 4-5 times with a skewer to vent. Cook on centre rack of oven for 1 hour or until cooked through. Remove from oven, rest in bag for 15 minutes before serving. Was a little skeptical relying on premade flavors to season chicken but one afternoon I just felt lazy and used it. Came out golden and delicious! Hi, sorry for the confusion. We had some pack changes to the Cook In Bag, so please just follow the instructions on your pack & that should be fine. Feel free to give us a call at 1800 888 997 if you need further clarification. Hi Pam, our Cook In Bag no longer requires you to pierce the bag before placing in the oven. Sorry for the confusion.